DUBLIN -- A roar reverberated around the Dublin High School track in the final heat of the boys 3,200 meters Saturday at the Dublin Distance Fiesta. And that started during the first 400. In an outstanding race that included two defending California state champions, Jesuit-Carmichael's Matt Strangio produced a national-leading mark of 8 minutes, 47.97 seconds. That included a 4:22 final 1,600 for the 3,200 state champ. Redwood-Larkspur's Liam Anderson, the defending 1,600 champion, was second in 8:56.88. Both times were well under the national-leading mark entering the race. "Really going into it, I'd just been feeling good all day and all week, really all year," said Strangio, a junior, whose previous personal record was 8:56. "Stepping out the first lap felt good. I'm like 'OK, I got this.' 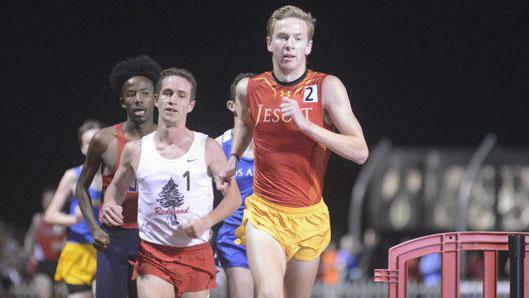 "
Strangio held a national-leading mark of 4:14.45 in the 1,600 entering this weekend, and he said in a distance medley relay last week, he anchored 4:10. His time Saturday shattered the previous meet record of 8:56.07, set by St. Joseph Notre Dame-Alameda's Cooper Teare in 2016. The conditions were pristine at the Dublin Distance Fiesta, which is considered the largest distance high school track meet in the nation with 118 schools, 2,633 athletes and 3,649 event entries. The top two fastest placers in each event qualified for the Arcadia Invitational on April 5-6, including the Invitational Session for the 3,200. 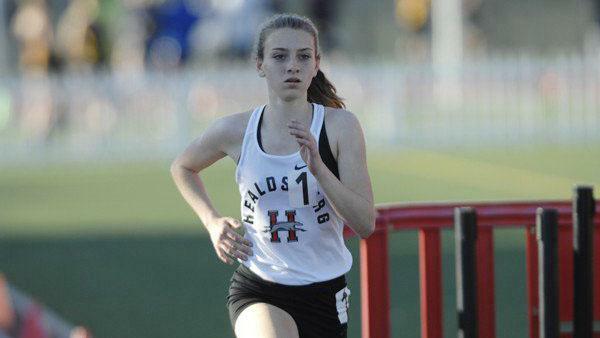 Watch the Girls 800m "Sombrero Heat"
On Saturday, the first lap of the boys 3,200 fastest heat signaled the greatness to come. "I kinda wanted to establish a bit of a presence early (in the race). I knew Liam ran an 800 earlier today," said Strangio, who riveted the crowd along with Anderson when they passed the first 400 in a jaw-dropping 63 seconds. "I was shooting for a 64." By 500 meters, the lead pack had already dwindled to five. Strangio and Anderson were in front, leading through lap-splits of 65 and a pair of 67's to pass the 1,600 mark in 4:25. Even though the lead pack shortly dwindled to two, Strangio said that the next two laps were very hard for him. He and Anderson ran a 68 on both lap five and lap six. But then Strangio began to pull away. His 67-second 400 on lap eight was three seconds clear of Anderson before closing with a 59-second 400. 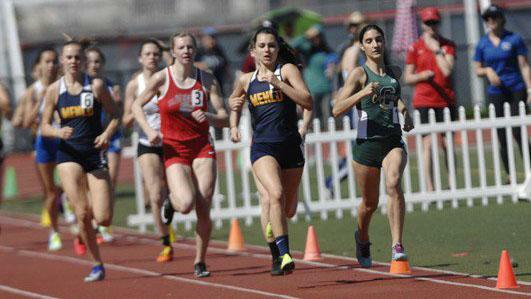 Charlotte Tomkinson of Menlo School-Atherton also produced a state-leading time in Saturday's meet. In a battle that included two of the top six placers in last year's state championship final, Tomkinson edged Concord's Rayna Stanziano to win the fastest heat of the girls 800 with a time of 2:10.61. Stanziano was second in 2:11.22. Entering this weekend, the state-leading time was 2:14.12. That race also had a blazing start. Stanziano held the lead by the 150-meter mark and crossed 400 meters with Tomkinson in 63 seconds. Stanziano led through 600 meters before Tomkinson kicked to victory. "I didn't know any of the splits. I had no idea what the time was until I was in the homestretch. I just kind of raced off how I felt," said Tomkinson, a junior. "Last year this race, I was nowhere near the front. "I've raced with Rayna at State. She's a really strong competitor," Tomkinson said. "I was just trying to stick with her in the first lap, and let her pace that, and then just kind of see what happened on the second lap and try to finish as strong as I could." Stanziano was third (2:09.440 and Tomkinson was sixth (2:10.58) in last year's State Championship final. "I wanted to be around 77 (per lap). I think I went a little bit too fast in the beginning," Peterson said. "I just tried to stay focused and keep moving forward." Carlmont-Belmont's Kaimei Gescuk moved up in the final three laps and placed second in 10:55.17. Both of the fastest heats of the 1,600 came down to impressive kicks. First in the girls race, Marin Catholic-Kentfield's Samantha Wallenstrom kicked in the last 200 to set a sophomore meet record and personal record of 4:59.38. "I didn't look at the clock at all. I don't like looking at the clock, so I wasn't really sure what I was doing. I knew that we were going really fast, and my goal was just to stick onto the people in front of me and hope they pulled me along," said Wallenstrom, who broke her personal record by 10 seconds. "At the last 200, I like to kick, and I was feeling pretty tired but I felt that I would just go for it and see what happened." In the fastest heat of the boys 1,600, Maria Carillo-Santa Rosa junior Pierce Kapustka also kicked to victory with a time of 4:22.97. 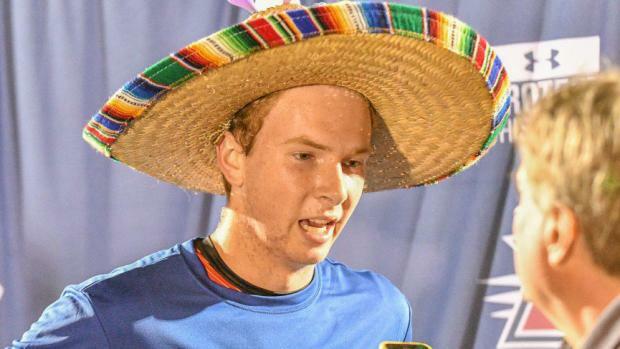 The winner of each final heat got a sombrero. "This is something I dreamed about, getting this thing," he said. "I thought I wouldn't do it until my senior year." Westmont-Campbell's Garrett MacQuiddy won the fastest heat of the boys 800 in a personal-record time of 1:55.07. "I was looking to be around the front for the second lap, and then I usually have a good kick, so I was looking to use that to my advantage," said MacQuiddy, a junior. The St. Francis-Sacramento team of Sophie DeBenedetti, Alexys Jones, Haley Silva and Izzy Fauria won the fastest heat of the girls distance medley relay in 12:22.61. In the boys distance medley relay, the Sir Francis Drake-San Anselmo team of Nicco Pompili, Josiah Russell, Owen Wolford and Amir Barkan produced the fastest time (10:44.32).